Uttar Pradesh Public Service Commission has notified recruitment for 2589 Assistant Conservator of Forest, Assistant Director of Mines, Assistant Engineer, Allopathic Medical Officer & Other posts. 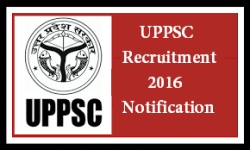 There are a total of 331 vacancies (328: General Recruitment; 03: Special Recruitment) for the Combined State/Upper Subordinate Services (General/ Special Recruitment) Exam 2016 (UPPCS Exam 2016). A total of 24 vacancies are there for the Assistant Conservator of Forest Examination 2015. While bachelor’s degree (post graduate degree in few) is the minimum educational qualification required for the posts, details related to experience and other eligibility criteria can be found from the notification links given below.